I've mentioned before that I volunteer to walk dogs at a local (local to me) rescue. I love spending time with these dogs and it's so great when we get to see one of them get adopted (it's also a little bittersweet because we get so used to spending time with them and we miss them when they go). One of the ones that has been there since I started volunteering was adopted over the weekend. I had no idea that he has never been in a house before. He's spent almost his whole life in a cage. Hard to imagine that such a happy dog had such a rough start to life. Brolin (along with another dog that was with us, Zephyr) came into the Floyd Animal Control in Georgia, as a neglect case over 18 months ago. They were driven in a transport to a rescue western Pa, where that rescuer had them brought to the facility where we board rescue dogs around June of 2013. However, the PA rescue group never made a payment for them at the facility, and so their future looked bleak. 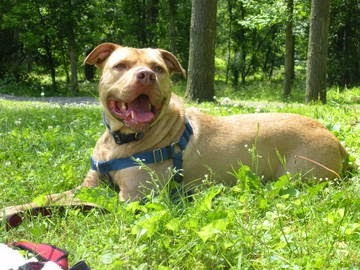 Rather than allowed the two dogs to be taken to Baltimore County Animal Control, AAHA (Adopt a Homeless Animal rescue) took them in, and paid to board them, as well as paid all of the costs of Brolin's Lyme disease and heart worm treatment. 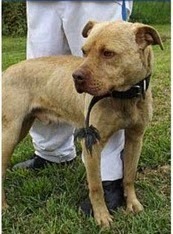 Below is a photo of Brolin when he was taken into the Floyd Animal Control. Zephyr was adopted a couple months ago. Brolin, who absolutely loves people, loves to cuddle and give kisses, LOVES going for walks and is great on a leash...for some reason we just couldn't find a home for him. I sent out word to people I know and asked my brother (who works for a vet and knows lots of dog lovers) to do the same. One of his colleagues picked up Brolin the other day and is already in love with him (no surprise there as he's a fantastic dog)! He's now living large on a 8-acre farm and adjusting to the new experience of being in a house. No more cage-life for this awesome dog!! 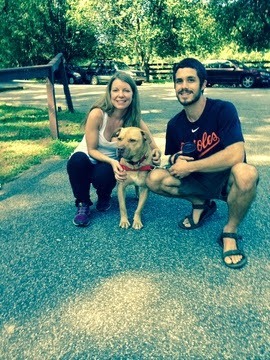 Brolin with his adopters when they picked him up. I can't wait to go visit this sweet boy at his new HOME! What a cutie! I am so happy for him!